With corporate data breaches making the headlines on an almost daily basis, the deployment of an overall encryption strategy by organizations around the world has steadily increased. This year, 45% of respondents say their organization has an overall encryption plan applied consistently across the entire enterprise with a further 42% having a limited encryption plan or strategy that is applied to certain applications and data types. Employee mistakes continue to be the most significant threat to sensitive data (54%), more than external hackers (30%) and malicious insiders (21%) combined. In contrast, the least significant threats to the exposure of sensitive or confidential data include government eavesdropping (12%) and lawful data requests (11%). The main driver for encryption is protection of an enterprise’s intellectual property and the personal information of customers – both 54% of respondents. With more data to encrypt and close to 2/3 of respondents deploying 6 or more separate products to encrypt it, policy enforcement (73%) was selected as the most important feature for encryption solutions. In previous years, performance consistently ranked as the most important feature. Cloud data protection requirements continue to drive encryption use, with encryption across both public and private cloud use cases growing over 2018 levels, and organizations prioritizing solutions that operate across both enterprise and cloud environments (68%). With the explosion and proliferation of data that comes from digital initiatives, cloud use, mobility and IoT devices, data discovery continues to be the biggest challenge in planning and executing a data encryption strategy with 69% of respondents citing this as their number one challenge. The use of hardware security modules (HSMs) grew at a record year-over-year level from 41% in 2018 to 47%, indicating a requirement for a hardened, tamper-resistant environment with higher levels of trust, integrity and control for both data and applications. HSM usage is no longer limited to traditional use cases such as public key infrastructure (PKI), databases, application and network encryption (TLS/SSL); the demand for trusted encryption for new digital initiatives has driven significant HSM growth over 2018 for code signing (up 13%), big data encryption (up 12%), IoT root of trust (up 10%) and document signing (up 8%). Additionally, 53% of respondents report using on-premises HSMs to secure access to public cloud applications. The highest prevalence of an enterprise encryption strategy is reported in Germany (67%) followed by the United States (65%), Australia (51%), and the United Kingdom (50%). Payment-related data (55% of respondents) and financial records (54% of respondents) are most likely to be encrypted. Financial records had the largest increase on this list over last year, up 4%. The least likely data type to be encrypted is health-related information (24% of respondents), which is a surprising result given the sensitivity of health information and the recent high-profile healthcare data breaches. 61% of respondents classify key management as having a high level of associated “pain” (a rating of 7+ on a scale of 10). This figure is almost identical to the 63% of organizations that use six or more separate encryption products, suggesting there is clear correlation between the two findings. Support for both cloud and on-premises deployment of encryption has risen in importance as organizations have increasingly embraced cloud computing and look for consistency across computing styles. Download the 2019 Global Encryption Trends Study here. 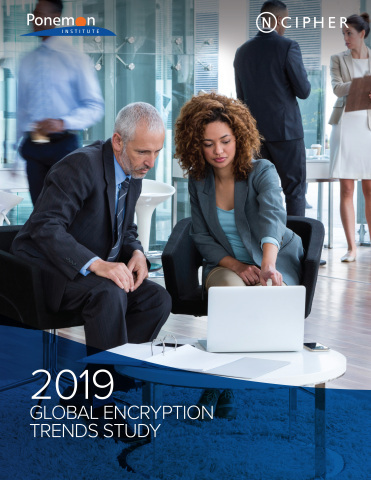 The 2019 Global Encryption Trends Study, based on research by the Ponemon Institute, captures how organizations around the world are dealing with compliance, increased threats, and the implementation of encryption to protect their business critical information and applications. 5,856 individuals were surveyed across multiple industry sectors in 14 countries/regions: Australia, Brazil, France, Germany, India, Japan, Mexico, the Middle East (which is a combination of respondents located in Saudi Arabia and the United Arab Emirates), the Russian Federation, South Korea, the United Kingdom, the United States and, two new regions in Asia for the first time, Southeast Asia (Indonesia, Malaysia, Philippines, Thailand, and Vietnam) and Hong Kong and Taiwan. Follow us on LinkedIn, Twitter, Facebook and Instagram – search nCipherSecurity. Today’s fast moving digital environment enhances customer satisfaction, gives competitive advantage and improves operational efficiency. It also multiplies the security risks. nCipher Security, a leader in the general purpose hardware security module (HSM) market, empowers world-leading organizations by delivering trust, integrity and control to their business critical information and applications.